With both men and women competing on the world stage in Vancouver for the 2010 Olympic Games, most will tell you that over these two weeks of competition gender inequality does not exist. That however is not entirely the case. Many individuals questioned and scrutinized the Canadian Women’s Hockey Team’s choice of celebration after photographers captured pictures of several players puffing on cigars, and drinking beers on the ice hours after their gold medal victory. Was this fair? Not really, especially after one considers what skeleton gold medalist Jon Montgomery did during his medal presentation, as he chugged a pitcher of beer on his way to the stage. We should make it clear, however, that we are not attacking Jon and his actions here. In fact, we love it! 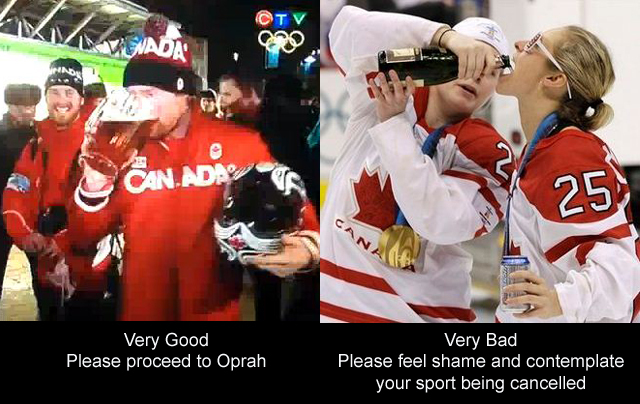 He and the women’s hockey team earned the right to celebrate, so who are we to judge the manner in which they do it.